Combat experience with the Rebel Alliance showed that the standard TIE Fighter was under gunned to deal with shield equipped Rebel Fighters and suffered heavy losses. The engineers at Sienar Systems decided to redesign the profile of the Solar Panels, add a more powerful engine and four more laser cannon at the apex of each triangular panel thus tripling the firepower of a standard TIE Fighter. These faster more powerful interceptors were replacing the standard TIE Fighter in Imperial Fleet Units when the Battle of Endor happened which lead to the death of the Emperor, Darth Vader, Fleet Admiral Piett, the destruction of the Fleet Flagship Executor and the 2nd Death Star (not the finest day of the Imperial Star Fleet.) Production of these fighters continued after the fall of the Empire as the remnants of the Imperial Navy fought against the New Republic. 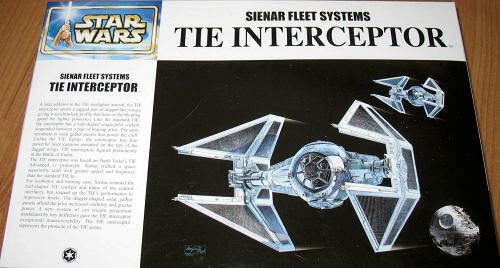 The TIE Interceptor made its only appearance in the “finale” of the Star Wars saga, The Return of the Jedi as part of the wave of TIE fighters defending the Death Star Jr. against the Rebel Fleet. This space battle almost made up for the appearance of the excruciating appearance of the Ewoks. Almost. 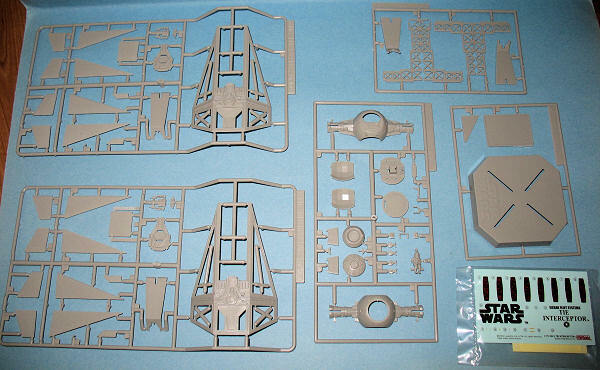 It contains 62 Grey Styrene Parts (plastic is similar to Hasegawa’s in terms of quality) and 2 clear parts for the front windscreen and the entry hatch. My copy of the kit does not contain any flash or manufacturing errors. Included in the kit are the stand and a pilot figure as well as decals and adhesive masks for the clear bits. Most of the parts are identical to the TIE Fighter which is not surprising as the fuselage is identical. The only major difference between the TIE Fighter and TIE Interceptor is the “wings.” The “wings” come in several pieces with the frame separate from the solar panels. This makes for easier painting as masking is not required, but can make assembly difficult if you don’t pay attention and mix up the panels. The few decals that come with the kit seem to be in register and from past experience are easy to use and not the typical thick Japanese decals that many of us have encountered when building Tamiya or Hasegawa kits. Micro Sol/Set deal can be used with them. The instructions come in Japanese, but they are well detained enough that you do not need to know Kanji characters to figure them out with all the color call outs from the Gunze and Tamiya line of paint. The Fine Molds series of TIE Fighters are very easy kits to assemble. They are great for any level of modeler and/or Star Wars Fan. Highly recommended.